Vote for Jabari Brisport and Join the Fight for Socialism! Socialist Alternative NYC is endorsing the socialist city council candidate Jabari Brisport. Brooklyn native Jabari Brisport is running for City Council in the 35th City District against incumbent Democratic Party Council Member Laurie Cumbo. Brisport’s campaign is standing up to the developers who are driving up the cost of living and displacing working-class residents. “What I tell people is gentrification isn’t caused by white people, it’s caused by capitalism,” explained Brisport in a recent interview with the Intercept. His campaign calls for the passage of an anti-speculation tax and a vacancy tax to pay for more affordable housing. He calls for police reform, including passage of the Right to Know Act, ending Broken Windows, closing Rikers Island, and he calls for replacing the NYPD’s Civilian Complaint Review Board appointed by city officials with a review board that is elected by the public. He also supports raising taxes on the 1%, a transition to 100% renewable energy sources by 2030, and he opposes high stakes testing and charter schools. Council Member Cumbo, on the other hand, represents everything wrong with the liberal establishment in New York. She does and says just enough to sound “progressive” but at the end of the day, her political approach stays within the limits of what’s acceptable to the real powers who control city’s political establishment – Wall Street and the big developers. Cumbo supported the Bedford Armory development project until a grassroots community campaign led by socialists and tenants groups exposed the deal as a boon to developers and made it politically unviable. Brisport not only opposed the deal from the start, but he also participated in the campaign against it. It is significant that Brisport has chosen to run as a self-identified socialist and also independent of the Democratic Party on the Green Party ballot line. New York is essentially a one-party town – the Democratic Party completely dominates city politics and has implemented a pro-developer and big business agenda. As a result of this, the 1% enjoys booming fortunes while the 99% faces a worsening transit crisis, continued racist policing, no real end in sight to mass incarceration, skyrocketing rents, and historic levels of inequality. De Blasio’s four years in office serve as a glaring example of how it’s impossible to both represent the rich establishment and working people at the same time. Working people always lose out in that scenario. Things don’t have to be this way. Millions of people are tired of establishment politics and want a bold alternative. Young people, in particular, voted for Bernie Sanders in droves. Black Lives Matter inspired a whole generation to fight unapologetically against racism, and Socialist Alternative and other progressive forces have grown substantially. Brisport himself is a member of Democratic Socialists of America, an organization that has grown to over 2,000 members in NYC. These are expressions of the growing confidence of working people to fight back. Together, we have a historic opportunity in the period ahead to build a united, independent challenge to establishment politics and a real, independent political voice for the 99%. 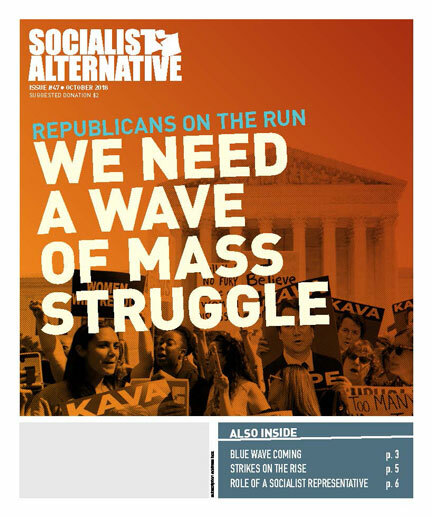 Socialist Alternative calls for uniting NYC’s vibrant left – including socialists, Black Lives Matter, radical unions and worker organizations, immigrant groups, Occupy, and other progressive forces – around a clear platform of pro-worker, anti-racist policies that stands in sharp contrast to the agenda of the Democratic Party establishment and the billionaire class. We support building a united mass movement to fight for such an agenda, along with candidates and elected representatives who are truly accountable to our movement; who reject corporate cash; who use elections and elected office to build mass movements as the key force for change; who support building mass democratic and fighting organizations; and who are willing to fight for socialist policies based on demanding what working people need, not what Wall Street or their rotten capitalist system can afford. We believe the strategy of reforming the Democratic Party is a dead end, and see a historic opportunity opening up to build a new mass party of the left which we believe is needed. Brisport’s campaign can be an important step. Given the growing anger among the 99% at the establishment a strong campaign is possible. However, we must be clear that elections under capitalism are not the most favorable terrain for the working class. Our fundamental power lies in our ability to collectively shut down the profit-making machine of capitalism through mass action. Elections come down to the question of who votes on election day, which tends to be an older and wealthier demographic. DSA’s membership, in particular, will be a key factor for Brisport’s campaign. With hundreds of members in Brisport’s district alone, there is a strong basis for building a well-organized, independent and disciplined grassroots campaigning force that can raise significant money and help turn out the votes needed. An indication of what’s possible if we are well organized is the 2015 re-election campaign for Socialist Alternative city councilmember Kshama Sawant. With 600 volunteers, we raised $450,000 without taking a dime from business, we knocked on 90,000 doors, and we defeated corporate cash, a vicious media campaign, and a hostile establishment opposition that united corporate Democrats and right-wing Republicans against us. It is vital to recognize the limitations of elected office. We must ensure election campaigns and elected offices are based on a strategy of building mass movements and do not rely on parliamentary arithmetic – which is a dead end for socialists under capitalism. Kshama Sawant has a single vote in Seattle and has won numerous victories by basing herself on struggles of fast food workers, Black Lives Matter, indigenous peoples, tenants, and others. As she says, “What can be won in City Hall, depends on the strength of movements outside City Hall.” Toward this end, we need elected representatives who are genuinely accountable to our movements. We welcome Brisport’s decision to take only the average wage of the people he represents. We also strongly support the decision to use his campaign to launch a socialist ballot line in New York, which points away from the trap of the corporate-dominated Democratic Party and will be a great tool for socialists in elections. We look forward to campaigning alongside Brisport, the Green Party, DSA and others as part of building a united, vibrant movement while discussing out issues in a comradely manner and clarifying how we can most effectively win the change we need. Vote for Jabari Brisport and join the fight for socialism!